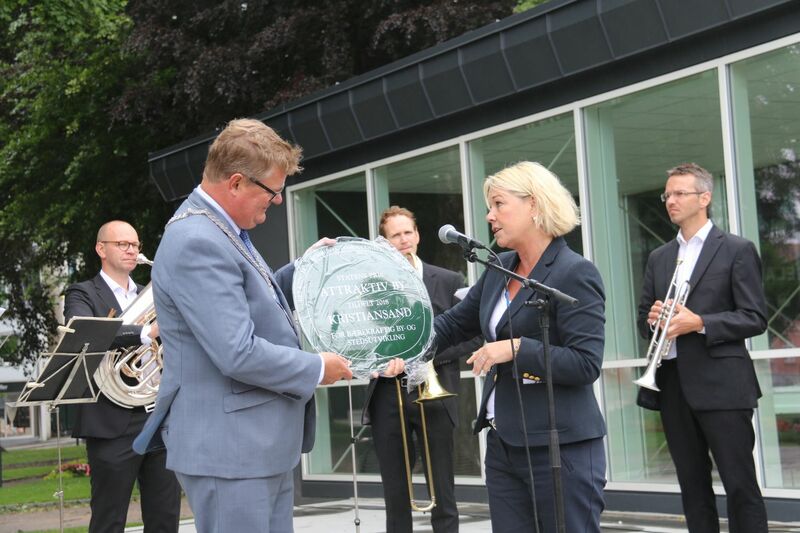 Monica Mæland, minister of Local Government and Modernisation, presented the award at the town square in Kristiansand on June 18th. - It is impressive to see how Kristiansand, in cooperation with public and private actors, has achieved a very positive development that unites old and new and has given a new life to the city center," said Mæland. A jury consisting of six people from the private and public sector has awarded Kristiansand the highly regarded distinction. Leader of the jury, Erling Dokk Holm gave honors to the city both for a clear commitment to the development of the city center, and for the very high quality of what is being built in Kristiansand. - The jury's focus is promoting new development and sustainability. The city is finer than ever. The good old fashioned city model is the most robust we have, it's something that gives us diversity. A city without people living in the it is not a city. You have managed to focus on quality not only in what is being built but also in processes. There are many places in the country that are built poorly. This is not the way in Kristiansand. Here we see modern housing construction that works incredibly well. The buildings will last for hundreds of years. You should be proud of that, said Dokk Holm when holding his speach on the award ceremony. Dokk Holm looked forward to the work of linking the University and the hospital closer to the city center, he also described Kristiansand as a pioneer of cultural urban development. "The range and quality of cultural activities mean more and more when deciding where to live. When you're in a city, it's something you notice. You are very strongly aware that there are people and activity in the streets of Kristiansand. Thank you very much Kristiansand, I'm really glad you received the prize. There was really no doubt. It was not difficult. Congratulations!